Click to open expanded view. Quality Original english goods. Always fresh and current. What does Rescue® mean? Rescue (Five Flowers) is a combination of five of the Bach flower essences. It soothes the stress and tensions of everyday life. The First Aid Essence get us back to normal. We can calmly deal with any situation like: after getting bad news, before an exam, when feeling tension, any time you loose balance mentally, stress, job interviews, emergencies. Production and bottling: Rescue® is manufactured according to the specifications of Dr Bach and mechanically filled into brown thin-walled glass bottles with dropper. Conservation and shelf life: Rescue® contains about 27% alcohol. It has a shelf life of 5 years. The filling quantity is 20 ml, the weight approx. 37 g.
The diameter of the bottle is approx. 23.5 mm, the height 93.0 mm. It has a shelf life of 5 years. 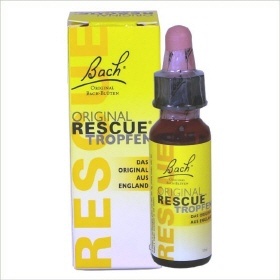 Rescue (Five Flowers) is a combination of five of the Bach flower essences. It soothes the stress and tensions of everyday life. The First Aid Essence get us back to normal. We can calmly deal with any situation like: after getting bad news, before an exam, when feeling tension, any time you loose balance mentally, stress, job interviews, emergencies. Give four drops of Rescue® into a glass filled with water. Stirring or shaking is not necessary. Drink this mixture throughout the day. Give two parts water and one part brandy or fruit vinegar in a mixing bottle. Then add six drops of Rescue®. We recommend to take four drops of this mixture four times a day. Put 2 drops Rescue on your tongue. Do this every 5 to 15 minutes. There are no certificates and information about the origin of Bach flowers used in Nelson products. Available in 20 ml pharmacy bottles with dropper. For classical Bach flower application. Available in 20 ml pharmacy bottles with spray head. Convenient. With and without alcohol. 20ml. Five Flowers and FF Night. Dropper and spray. Organic!